Rising straight out of the Atlantic Ocean around 1,500Km off the coast of mainland portugal is the Azores (Açores) archipelago. Volcanic in origin the chain stretches nearly 600Km and comprises of nine significant islands and eight smaller islets known locally as formigas (ants!). 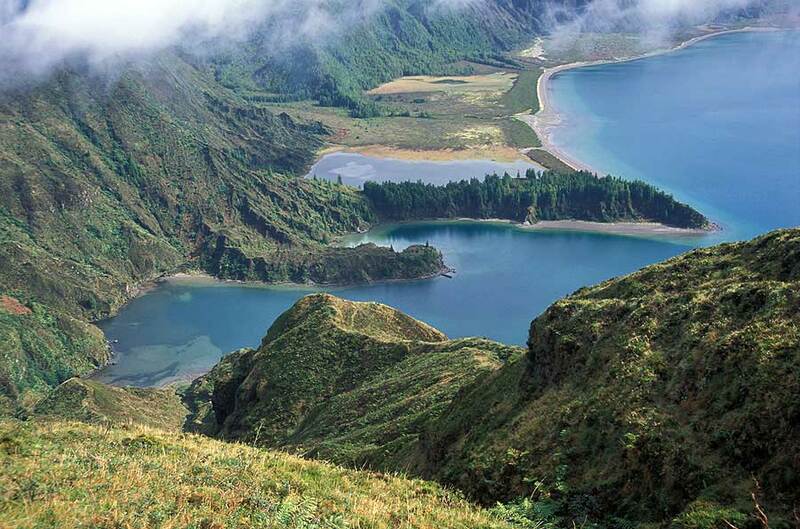 The landscape of the Azores is quite stunning, owing much to their volcanic origins. Ranging from the conical Pico, Portugal's highest mountain to the numerous craters, many home to beautiful lakes, one thing is constant throughout the islands - a covering of lush vegetation. It has been said that the islands look like a cross between Hawaii and Ireland. Located on roughly the same latitude as Lisbon the climate of the Azores is fairly moderate, temperate, maritime climate. Without the influence of continental Europe the weather is dominated by the sea. Average rainfall is quite high and more than doubles between the east and the west islands. Temperatures range between 17 °c and 23°c over the year and there are less hours of sunshine than on the mainland. The Azores High is named after the islands and is a large semi-permanent area of high pressure affecting weather in western Africa and Europe. In 1976 the Azores became one of 2 autonomous regions in Portugal (the other being Madeira) with the Constitution of the Republic of Portugal being amended to facilitate this. To reflect the extensive geographical spread of the archipelago the various government departments are located on various islands. The executive section of the local authority has been located in Ponta Delgada (Sao Miguel), the legislative in Horta (Faial) and the judicial in Angra do Heroísmo (Terceira).